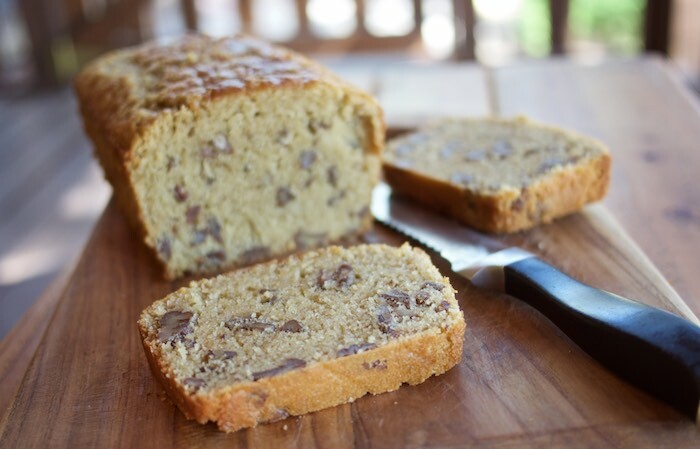 There's something about a classic pecan pound cake that is comforting to me. The combination of pecans and buttery goodness evokes such vivid memories of my grandmother and her love for dessert. So when I came across the recipe below for Coffee Pecan Pound Cake on Love Foodies I knew I had to make it. Pecans and coffee are combined in this moist loaf that is delicious served for breakfast, a mid-day snack, or dessert. 4 Teaspoons of coffee granules dissolved in 2 Tablespoons hot water. Heat oven to 160 C, Gas 3, 300 Grease and line your baking tin. See here for how to line. Get all your ingredients ready, i.e dissolve the coffee, sieve the flour, and add the salt and baking powder to the flour etc. Crush the pecans a little with your hand so they are not such big pieces. Add half the milk with half of the flour, keeping the mixer on a slow speed. Once combined, add the coffee mixture, the rest of the milk and flour. Fold in the pecans. Transfer the cake mixture to the greased and lined loaf tin. Drop it from a 3 cm height onto the work surface to level it out, then place in the oven for 1hr and 20 minutes, check after 1 hour and 5 minutes to see if it is cooked, using a skewer. Every oven varies, so keep an eye on your cake! Allow to cool. Store in an airtight container. You can also freeze half or all of it, wrap in parchment paper, then place in a zippy bag. Defrost as normal and enjoy! It will still be moist. Yummy! Who doesn't love coffee? And it combination with a dessert is perfection. What kind of tea do you suggest with this delightful cake?